Proper oral hygiene for dental implants is equally as important as the hygiene that you provide your natural teeth. 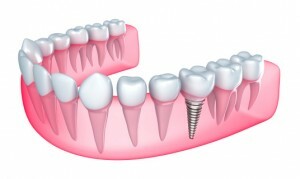 In fact, with daily care, dental implants can last a lifetime—just like your own teeth. You’ll need to pay close attention to the tissue that surrounds your implants. The health of gum tissue around dental implants is critical to the continuing stability of your implanted teeth. Therefore, brushing and flossing are vital. Don’t be fooled into thinking that just because your implants are made of titanium and porcelain they are invincible. Plaque can lead to the downfall of natural teeth and dental implants, too. Therefore, removing plaque with twice daily brushing and once a day flossing is essential. Otherwise, a condition known as peri-implantitis may develop. This bacterial infection can destroy the delicate support system that exists among your jawbone, gum tissue and the implant. Left untreated, peri-implantitis can lead to bone loss, which may then necessitate removing the implant and the attached restoration. Just like natural teeth, the restoration portion of your implants can scratch. Therefore, be sure to use a toothbrush with soft bristles and fluoride toothpaste that is low-abrasion. Brush all the surfaces of your dental implants—the chewing, lingual and facial surfaces. After brushing, floss in between your teeth and dental implants. Gently guide the floss between the implant and adjacent tooth. Then, move the floss up and down and back forth, taking special care to reach all the way down to the gum line. Dental checkups that include a cleaning and exam are as important to the health of your dental implants as they are to your natural teeth. At these regularly scheduled visits, our dental hygienist can use special hand instruments if necessary to carefully clean around the implants. Similarly, we have tools to remove any dried on plaque or tartar that won’t mar the surface. If you have questions about how to care for your dental implants, Collierville dentist Dr. Holcomb has the answers. Call our office today.